OAK RIDGE, Tenn., September 16, 2016—The lighter wand for your gas BBQ, a submarine’s sonar device and the ultrasound machine at your doctor’s office all rely on piezoelectric materials, which turn mechanical stress into electrical energy, and vice versa. In 1997, researchers developed piezoelectric materials that were 10 times better at coupling electrical and mechanical responses than prior state-of-the-art materials. But even scientists did not understand why the newer materials were so responsive. 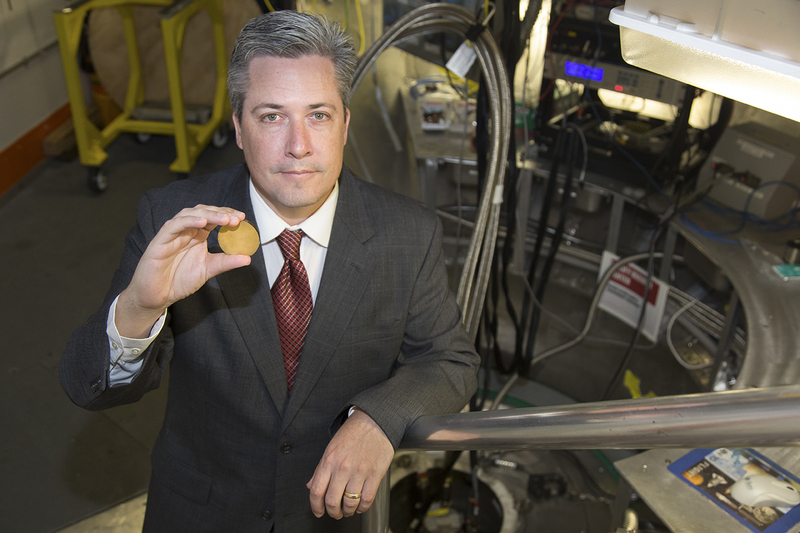 Now, scientists at the Department of Energy’s Oak Ridge National Laboratory and their research partners have used neutron scattering to discover the key to piezoelectric excellence in the newer materials, which are called relaxor-based ferroelectrics. (A ferroelectric material has electrical polarization that is reversed by application of an electric field.) Their findings, published online in the journal Science Advances, may provide knowledge needed to accelerate the design of functional materials for diverse applications. Relaxor-based oxide ferroelectrics have revolutionized piezoelectric devices. In medical ultrasound, for example, the mechanical pressure of sound waves generates images of a person’s interior. Compared with the performance of traditional materials, the stronger response of relaxor-based ferroelectrics yields a more detailed electrical signal that produces better images. Instead of having somewhat blurry guidance from 2D images to diagnose a cause of pain, assess prenatal condition, guide a biopsy or assess damage after a heart attack, doctors now rely on finely detailed 3D imagery. These modern materials also made it possible to focus ultrasound waves for noninvasive medical treatments of conditions such as tumors or gallstones. This technology passes individual beams harmlessly through tissue; the beams converge on a target where their effects are concentrated, like light passing through a magnifying glass to ignite paper. “We figured out at an atomic level why certain materials are so great at mechanically responding to an electric field by changing shape or size,” said lead author Michael Manley of ORNL. “The finding provides a basis for high-performance actuators and sensors.” Compared to traditional polycrystalline materials, the newer piezoelectric crystals generate a greater mechanical force in response to an applied electric field. The ORNL-led team was surprised to learn that the key to the impressive performance of relaxor-based ferroelectrics is the vibrations of tiny volumes of the material, called polar nanoregions, in which the positions of a few positive and negative ions shift slightly to create miniscule regions of electric polarization. The mechanical response of relaxor-based ferroelectric crystals is based on rotations of larger electrically aligned domains, about 20 microns in size. For these macroscopic regions of polarization to rotate, the atomic layers in the entire domain must displace around one another, or shear. Polar nanoregions as narrow as 2 nanometers are responsible for the enhanced electromechanical coupling (i.e., conversion of electrical to mechanical energy, and vice versa) that enables the dramatic improvements in piezoelectric applications by lowering the resistance to this shearing in the crystal. Understanding how polar nanoregions enhance material performance is relevant to the investigation of broad classes of chemically disordered materials beyond relaxor-based ferroelectrics, including shape-memory alloys, colossal magnetoresistors, magnetic semiconductors and some superconductors. The new study used neutron scattering measurements of lattice dynamics and local structure to reveal the basis of the giant electromechanical coupling. Traditional ferroelectric materials are stiff; it is difficult for their large domains to rotate. But in ultra-responsive modern relaxor-based ferroelectrics, vibrations of the polar nanoregions mix with vibrations of the surrounding lattice to form hybrid vibrations. The hybrid vibrations result in a softer, low-energy shear, which makes it easier for the macroscopic regions of polarization to rotate. That means a larger mechanical response when an electric field is applied. “The point of this whole story is that it’s the interaction of these nanoregions with the average lattice which enables a larger mechanical response from a smaller field,” Manley said. Manley’s coauthors are Douglas Abernathy, Andrew Christianson, Paul Stonaha, Eliot Specht and John Budai of ORNL; Raffi Sahul of TRS Technologies and Daniel Parshall and Jeffrey Lynn of the National Institute of Standards and Technology. Portions of this work were conducted at the Spallation Neutron Source and High Flux Isotope Reactor, DOE Office of Science User Facilities at ORNL. The DOE Office of Science supported the work. The researchers also used neutron research facilities of the Department of Commerce’s National Institute of Standards and Technology.